Bringing together master artisans and young craftsmen, Yeol, the Korean Heritage Preservation Society, is holding an exhibition of modern craft art inspired by traditional craftsmanship. “Crafts of Fire” at the exhibition space Yeol Bukchonga in the neighborhood of Bukchon, central Seoul, running until Oct. 18, is a culmination of a yearlong project by iron casting master Kim Jong-hoon and young glass artist Yang Yoo-wan. Since 2013, Yeol has been supporting a project consisted of a master artisan and young artist every year, showcasing the results in an exhibition. “We have always emphasized the need of preserving Korean traditional crafts. But in the end, where is the meaning of preservation unless we actually use the products?” said Yun In-hyang, Yeol’s project manager. “So, this year’s focus was on the practicability. The pieces can be used in real life and they are for sale, too,” she added. Iron caster Kim carries on the family business of making large iron pots. But the pots have mostly gone out of use as kitchens have been modernized. 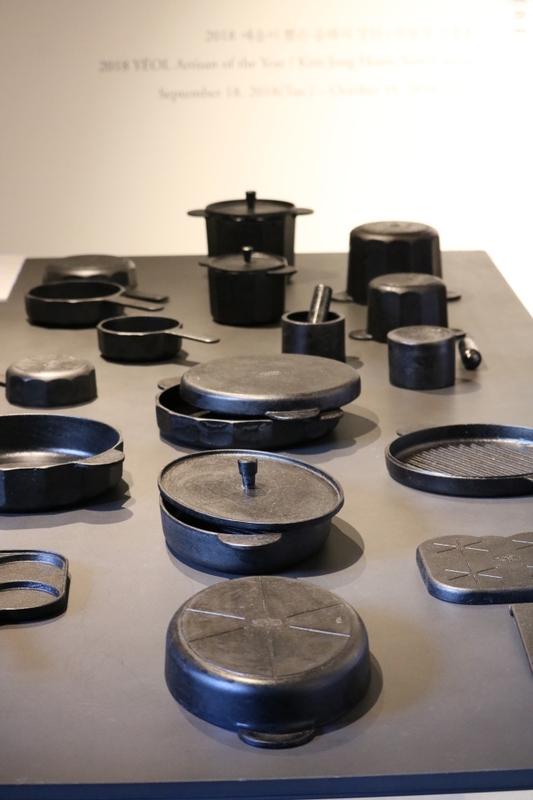 For the project, Kim created modern kitchenware using the handed down iron-casting techniques, collaborating with a contemporary designer. 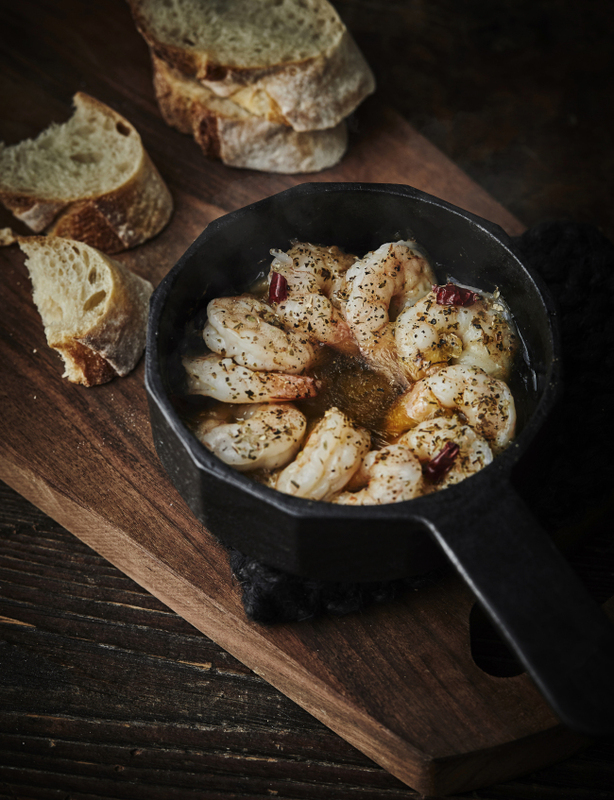 Saucepans, frying pans and grills which can be used in today’s kitchen were created through traditional iron-casting process. Also, small-sized products were made, reflecting the increasing number of single person households. “Though we selected Kim as the 2018 Yeol Artisan of the Year, it is rather his team of eight people who should be acknowledged, as iron casting is a collective work,” Yun said. 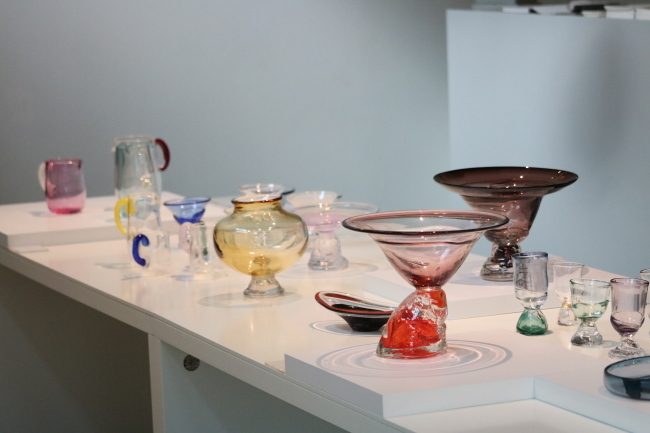 Glassblower Yang, a young craftswoman, created tableware pieces, such as bowls and plates, for this project. Though glass products, the pieces seem to be sturdy and crude. At first glance, it may be hard to grasp the pieces’ connection to traditional Korean craftsmanship. But upon closer look, the decorative elements inspired by traditional practices, such as white porcelain glazing and lacquering techniques, can be seen. As the exhibition is about crafts which can be used in the kitchen, Yeol collaborated with food stylist Roh Young-hee and shot a pictorial, showing how the pieces can be used in everyday life. Kim’s cast iron pieces are priced at around 100,000 won ($90). Prices for Yang’s glass pieces start at around 80,000 won.